This week the Air Quality Team visited the Student Activities Center on campus to evaluate green cleaning products in the building. This was in preparation for an audit of cleaning supplies and practices in UCLA Rec facilities. The team received access to the two supply closets used by janitorial staff and found them to be well-stocked and organized, containing products from the inventory list provided by their stakeholder Katie Zeller. The Air Quality team will perform the audit of cleaning supplies used in SAC, Wooden, and B Fit in the coming weeks. They hope to determine if any green cleaning alternatives can be introduced to replace less sustainable products and improve the air quality of these buildings. 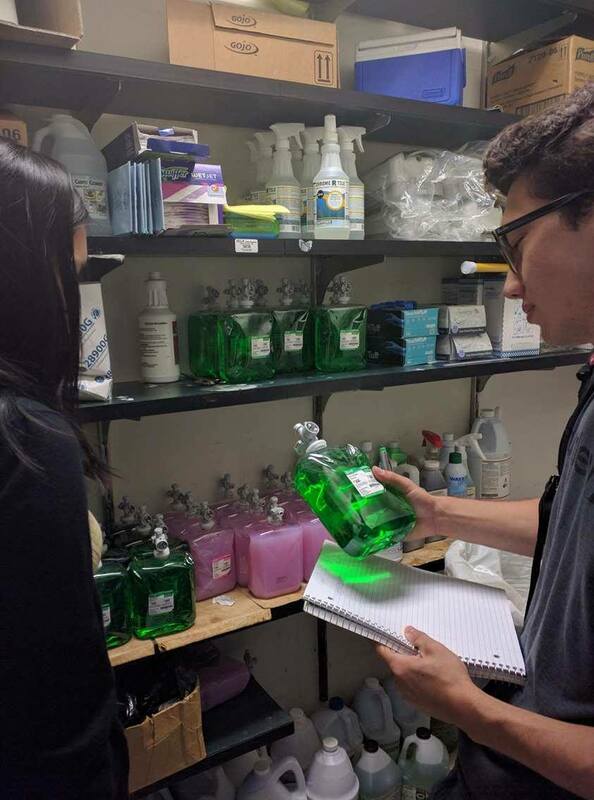 UCLA Facilities Management and Maintenance & Alterations have established the Bruin Green Cleaning Program, with a Green Cleaning Policy and a Sustainable Purchasing Policy, which may be a valuable resource for the team as they evaluate which products need replacement. Additionally, the Air Quality team will be continuing their data analysis of air filtration systems in Wooden and B Fit by creating graphs to gain insight into the efficiency of these systems. With information provided by their focus group, the team found that people largely feel comfortable in Wooden and B Fit, but learned that group exercise rooms can sometimes get stuffy and uncomfortable. The team will use this information to guide any future changes in the air filtration systems. The team is excited about these developments in their project and look forward to sharing their findings as the quarter continues!